Heartworm disease is a serious and potentially fatal condition that is caused by parasitic worms called Dirofilaria immitis. Heartworms are filarids a species of nematodes(roundworms). These parasitic worms live in the arteries of the lungs. The normal host is the dog but heartworm can also affect cat, wolves, foxes, ferrets, sea lions and (in rare instances) humans. 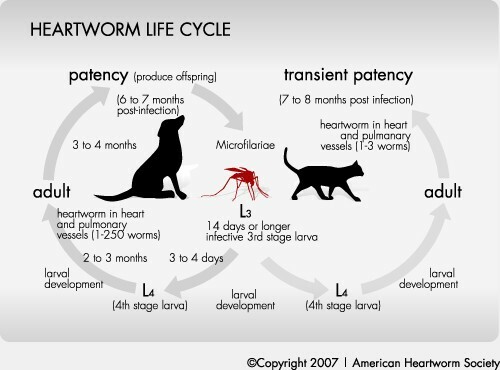 What is the lifecycle of a heartworm and how does it spread? Heartworm disease is spread from host to host via mosquitos. The mosquitos feed on the blood of an infected host, acquiring microfilariae from the blood meal from the affected dog. Once in the mosquito, the microfilariae mature into the infective larval stage. When the mosquito bites another dog the larvae are deposited on the skin and actively migrate into the host eventually ending up in the arteries of the lungs. This larval migration through the host takes about 2 months. The larvae travel through the connective tissue into the animal’s venous blood stream and are transported to the arteries of the lung where they mature into the adult form. The infected larvae take about 6 months to mature into adult form, known as microfilariae. The microfilariae can live 5 to 7 years in the dog. Cats can also be infected with heartworm disease. Cats are considered to be resistant hosts to heartworm. The presence of heartworm offspring in the blood of the host cat is less than 20%. Cats usually have a fewer amount of heartworms. The heartworms in the cat also tend to be much smaller than in the dog. The heartworms in the cat also have much shorter life spans, only living in host cat for 2 to 3 years. Severe Disease: Cough, exercise intolerance, dyspnea (difficulty breathing), abnormal lung sounds, hepatomegaly (enlargement of the liver), syncope (temporary loss of consciousness due to poor blood flow to the brain), ascites (fluid accumulation in the abdominal cavity), abnormal heart sounds, death. The heart and lungs are the major organs affected by heartworm disease. Other organs such as the liver and kidneys may also be affected. The dog’s activity level also plays a major role in the severity of the disease and the clinical signs seen in the dog. Cats are not routinely tested for heartworm disease because the antigen test is not as reliable in cats. Cats with a male only adult heartworm or immature heartworm infestation will show a negative test result. Cats can commonly have male only or immature heartworm infestations deeming the test not reliable. Other tools used after a positive blood test result to determine the severity of the disease are physical exam, radiographs, and/or ultrasound. 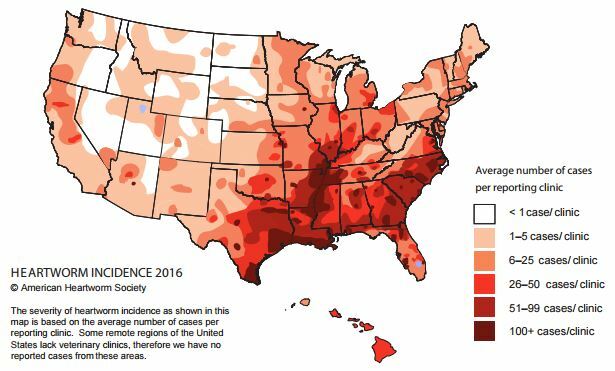 The map below shows the incidence of heartworm through out the country in 2016. You can see Indiana can see as much as 26-50 cases per clinic a year. Prevention is the best treatment. YEAR ROUND flea, tick, heartworm and intestinal parasite prevention is HIGHLY RECOMMENDED! There are so many prevention options available, it is difficult to know where to start. Our staff at Janssen Veterinary Clinic has done the leg work for you and we currently provide what we feel are the best options in preventative care, and we are happy to recommend the best product combinations based on your pet’s needs. Please be aware that medications purchased through your veterinary clinic are backed by guarantees and support of the manufacturer–these are not available through un-associated websites and over the counter stores. Please note that Oral flea preventive products are the best choice for dogs with flea allergies.